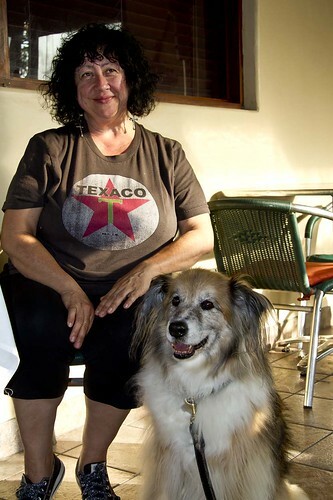 While we were eating outside at Granata's, Toni arrived with Sammy. Toni was obviously a "regular." I was surprised, but pleased that dogs were allowed to join their families when dining on the patio. Sammy was so well behaved, I was impressed. (I kept thinking, nobody would want me to bring my dog here.) As we chatted, Toni talked about having a goat in her back yard. 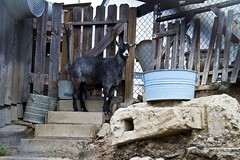 Somehow in one of my recent walks, I had not only passed her yard, but I had taken a picture of her goat...talk about 6 degrees of separation. Toni is my first in my 100 strangers project. To see pictures from Pam's and Ally's 100 strangers click here. That's just funny - small world! The 100 Strangers project is fun, but I haven't been out shooting people lately, I'm still on #8. That's one hell of a coincidence. That doggie looks so huggable. what a neat story. Maybe if i am very brave, I'll photograph 100 strangers in Beirut.